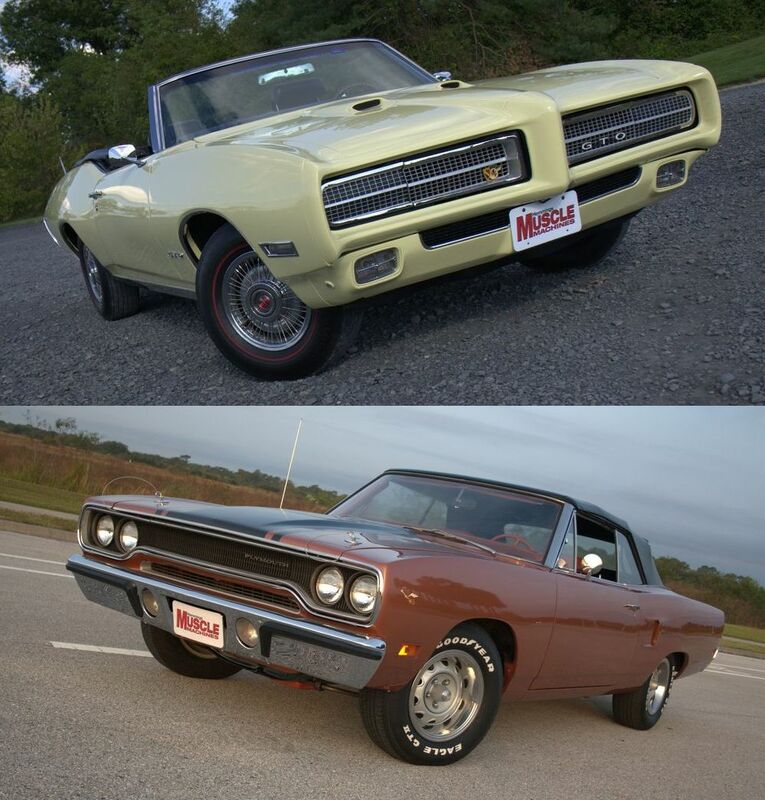 This or That – Summer Series: 1969 Pontiac GTO or 1970 Plymouth Road Runner? 1969 Pontiac GTO convertible (top); 1970 Plymouth Road Runner convertible (bottom). Images by the author. Editor’s comment: Please note that the This or That column is not a comparison report between two vehicles, but rather a feature that enables us, in an idyllic world, to add a collectible vehicle into our dream garage on a regular basis, but with a catch: We can only pick one vehicle from this pairing, and it has to be for enjoyment purposes rather than as an investment. So let’s climb into the ultimate automotive fantasy time machine and have a little fun. If you’ve been playing along during the last few weeks, you’ll have noticed that the This or That — Summer Series is dedicated to decades of drop-top driving. It continues in this installment as we present to you a 1969 Pontiac GTO convertible and a 1970 Plymouth Road Runner. Both performance models had already witnessed peak production–the GTO’s total 1969 run of 72,287 units and the Road Runner’s 1970 output of 41,484, indicate that these weren’t the best years for them. Ultimately, these legendary intermediates would go down different automotive paths following the model years represented here: The GTO would continue on GM’s A-body platform with minor visual facelifts, while the Road Runner had its chassis revamped by Mother Mopar and adopted dramatic “fuselage” styling. Both of these intermediates were featured as Restoration Profiles within our Hemmings Muscle Machines magazine. In base form, the $3,382 GTO convertible was delivered with a 400-cu.in. engine. Fitted with a four-barrel carburetor, it was rated for a comfortable 350 hp, power that was transferred through a three-speed manual to an open differential. Of course, it was supported by a heavy-duty frame and suspension system, along with drum brakes and 14 x 6-inch stamped-steel wheels. Interiors retained their traditional upscale vibe, thanks in part to a walnut-grained vinyl applique surrounding the basic gauge arrangement, while passengers were cradled by a Morrokide-covered split-bench seat. Among the more notable options were an economical (265-hp) 400, and either the Ram Air III or Ram Air IV powerplants; close- or wide-ratio four-speed manual, or THM-400 automatic; Safe-T-Track differential; power front disc brakes, Rally II wheels, bucket seats, Rally Gauge Cluster; and the Ride and Handling Package (more details can be found within this: Buyer’s Guide). Our feature Goat is equipped with the standard 350-horse 400, backed by the Turbo Hydra-Matic. More than two dozen other comfort and convenience options are also included. Pontiac assembled 7,436 convertibles this year, of which 4,385 contained the baseline 400/automatic powerteam combination. If you were reading contemporary road tests from the day, you probably would have been keenly interested in the January 1969 edition of Motor Trend, which documented the road merits of a 400/four-speed edition (with a 3.55:1-ratio gearset, power front disc brakes and power steering). According to trap lights, the GTO did 0-60 mph in 7.2 seconds while racking up a quarter-mile ET of 14.9 seconds @ 98.3 mph. Now on to Plymouth’s Road Runner, which–in 1968–had redefined the original intermediate muscle car concept of ’64. How so? While Detroit’s supercars had morphed into pricy, accessory-turned-standard-equipment powerhouses, Mopar recognized there was a need for a back-to-basics model that combined near-hair-raising power, aggressive styling, and an affordable price. Those basics largely remained for the 1970 model, which retained the B-body’s general unit-body shell while sporting a tasteful model-year update. In base form, the $3,289 Road Runner convertible muscled its way onto Main Street containing a stout 335-hp, 383-cu.in. engine that was linked to a three-speed manual transmission, followed by an open 8-3/4-inch differential containing a 3.23:1-ratio gearset. The chassis also featured heavy-duty suspension and brake systems, along with 14 x 6-inch steel wheels. If the “Power Bulge” hood didn’t tip off the car’s performance architecture, then perhaps the speedy cartoon emblems/decals did. Or, perhaps, the bank of gauges inside and the all-business-no-frills vinyl bench seat. The Road Runner’s option sheet was stout, featuring the choice between a 440 Six Barrel or 426 Hemi engine; four-speed or TorqueFlite automatic transmissions; performance axle packages and Sure-Grip differential; power front disc brakes; air conditioning; bucket seats; performance hood paint and reflective “Dust Trail” side tape stripes; hood hold-down pins; a revised “Air-Grabber” cold-air induction system; and Rallye wheels, to name a few (we outlined a few more details in this Buyer’s Guide). Thanks to Plymouth production records, it was determined that our feature car was one of just 824 convertibles assembled in 1970. When new, it had been optioned with (and still retains) the “Air-Grabber” system, along with a four-speed, the latter of which originally backed the base 383 engine (a healthy 440-6 was in place at the time the car was photographed). If you like “rare” build numbers, this one gets better, and only 179 of those convertibles featured a factory four-speed, and of those a mere 34 had the “Air Grabber” system. Interestingly, Motor Trend’s December 1969 issue tested a Road Runner with a 440-6/four-speed powertrain strapped into its chassis, along with 4.10 gears, power front discs, and power steering. Their staff recorded a 0-60 mph time of 6.6 seconds and a quarter-mile ET of 14.4 seconds at 99 mph (the report went on to state that, after it was tuned, the same Road Runner ran a 14.06 at 101.69 mph). “So, young man, which of these two appeals to you most?” the dueling dealers ask.